I'm hooked on making new dessert recipes. 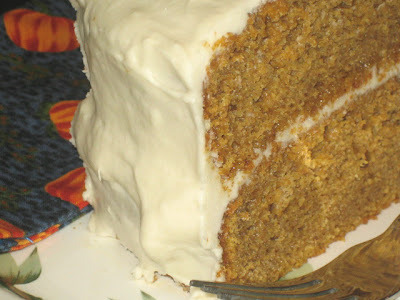 This is a new recipe for a Pumpkin Spice Cake with a Vanilla Buttercream Frosting. The catch is... this buttercream does not have any butter, or any margarine! Yet, it is thick, rich, and buttery tasting just as you'd expect in a buttercream frosting. How is this so, you say? Well, I got the idea after someone e-mailed me for a soy-free frosting recipe (because of allergies), and as we know vegan buttercream frostings use Earth Balance margarine, which contains soy. Plus, some other creamy frostings (many of my own recipes) use silken tofu, which obviously isn't an option if you have a soy allergy. So, I put on the thinking baking cap, got out my new and beloved KitchenAid mixer, and here you see the thick, creamy frosting coming together. Some of you know that a buttercream frosting is not normally one of my preferred things to make and eat. But, hallelujah, this frosting has changed my mind! Not that I still don't love the more generous, creamy frosting (as with my Triple Layer Chocolate Cream Cake)... oh, I do!... but this new recipe has joined my fave list, and I will be working on some variations on this frosting idea. Can't reveal the secret just yet, but hopefully will do so soon! Are you going to post the cake recipe as well as the icing?? I would loooove to make it. I have been looking for a soy free frosting recipe for almost a year! I can't wait for this reveal! oh YUM. i love pumpkin spice anything (just ask Starbucks), and I have been known to eat buttercream out of ziploc baggies. I'm not proud. But yeah, that looks ridiculous. uh, ya. i need this recipe. looks divine! Oh, I hope you reveal before Christmas....I have a family member with a soy allergy coming for the holiday, and I'd love to make this cake for her....I was just pondering today what I could make as a dessert for her. Hi, awesome blog! It's so good to find people writing about veganism. And I love to read about different recipes! I hope you reveal this secret soon too! I can't have soy either! Please share this recipe! oh you tease!! that looks awesome!! hi anonymous... no, it's not palm shortening - I've never used that actually. Nice guessing though! I can't wait for you to post this recipe! My children are allergic to dairy and soy so this recipe would be a lifesaver! My daughter is turning 5 at the end of November, I'd love to make this for her. Looks divine Dreena. Please share the recipe! My guess is coconut cream. Dreena, is it nut-free as well? If so, I would love to hear about that. Not to mention that, like Dayle, I adore anything pumpkin. P.S. Just got your ED&BV on the weekend! Can't wait to try some new recipes. Oh my, I would love a soy free frosting. I've been soy free for 2 years since my son was born. For our last birthday cake I used coconut and palm oils. Oh i can't wait! Let me guess, is it beans? Dreena!!! Please post this recipe. I will forever love you! Hello. Rick from Earth Balance here. I just wanted to let you know that Earth Balance now has a soy free version of our Original Spread (great for baking!) in a burgundy tub. It's rolling out to Whole Foods this month (April) and will be available at other stores beginning in June. It's not available in Canada yet, but we're getting a lot of interest. I hope you like it.